A Midgett Blog » Blog Archive » A Wedding Story — REDACTED! A Wedding Story — REDACTED! Four-and-a-half years ago I met my wife in Venezuela. If you’ve read my engagement story or wedding journal, you probably already know that we started seeing each other while traveling in a university group. 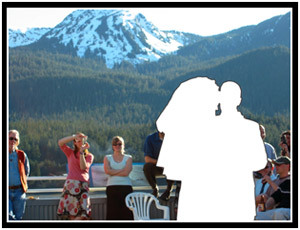 What you may not know is that another couple that met on that same trip just got married! ███████ ████’ and ██████ ███████’ big day was April 23rd and Oksana and I were very happy to have been a part of the celebration. Of course, their engagement came as no big surprise; we’ve been hanging out with ████ and ██████ at least once a week, almost without fail, for two solid years. Although we, like many of their friends, offered suggestions as they made their wedding plans, there hadn’t been many wedding-related ways for us to help out. Oh, months ago, Oksana offered her opinion on ██████’s dress and we both chipped in on little stuff like that, but it wasn’t until the bachelor and bachelorette parties that we really got into the mix. Of course, Oksana went out and partied late with ██████’s friends for her party — by all accounts, it was a raging success. ████’s party wasn’t nearly as rowdy, but the format of it, I must admit, was a stroke of genius! Instead of a single night with hangover consequences, we played computer games for the entire weekend. Whoever came up with that idea, wow¡­! The day before the big day, the penultimate day of ████ and ██████’s singularity, we attended the rehearsal dinner (which was curious, seeing as how we didn’t have a role in their wedding, and thus didn’t attend the actual rehearsal. But, hey, free food.) The gathering was held in the Gastineau Room of the Baranof Hotel. There was an open bar, a buffet dinner, and four or five tables all done up in the yellow and purple wedding colors. We mingled a little bit with their family and unfamiliar friends, but mostly socialized with our own core of Friday-night Trekkies. Toward the end of the night, Oksana began asking pointed questions about the ceremony and reception, trying to figure out if there were things with which we could lend a hand. Before I knew it, we’d acquired all sorts of responsibilities. Which was cool, actually. ████ did us a huge favor by playing music at our wedding (both the piano for the ceremony and as the DJ for our reception) and I was happy to reciprocate. As the evening began to wind down, ██████ announced that she wanted to unwind for half an hour or so with a few friends at Doc Waters. Oksana offered to give her a quick ride home beforehand; I joined ████ and his friends in walking down. While we were waiting for the girls to catch up, ████ ordered a Shirley Temple and, when the waitress got wind that he was getting married, added to his order a complimentary shot. His hesitation at pounding a shot on the eve of his wedding gave rise to the best line of the night. Presently, ██████ arrived and the lot of us attempted to chat over the live music — which just so happened to be played by███, one of ████’s Hedwig cohorts, and who, even-more-coincidentally, planned to play at the wedding. The music was convenient, too, as ██████ and ████ were able to spend a few moments practicing their internet-found dance steps for the coming reception’s first dance. After the Doc Water exodus, most of their out-of-town friends accompanied ████ and ██████ back to their new, nearly-completed house. While they had good reason to be there — that’s where they were sleeping, after all — Oksana and I joined them under the pretense of putting ██████’s hair up into curlers. We all sat around shooting the breeze while Oksana studiously applied rollers, hairspray, and scarves to the bride-to-be’s head in copious amounts. How she was going to sleep in that, I had no idea, but we left around midnight so she could try. Saturday; I woke up at 9am. Before I could even dig my customary Diet Coke from the ‘fridge, Oksana asked me to set up the camera for a time-lapse video. ██████ was due any minute, so I began stumbling my way around the apartment looking for all the necessary technological accoutrements. I didn’t quite get the laptop set up in time, but we were rolling within a couple minutes of when ██████ and her friend, █████, arrived. I spent the next four-and-a-half hours pretending as though I had important things to do. I wrote a card to go with our wedding gifts, I answered a few chat messages from ████, I generally lent a hand when I could, but mostly I tried to stay out of the way of the makeup/hairspray/dress tornado in the living room. Oksana, on the other hand, was a bride-prettifying bumblebee. From nine until noon, ██████ had her toenails painted blue; her hair unrolled, put up, and liberally sprayed; her makeup applied; and her eyelashes curled. She practiced her vows, drank liquid yogurt, and donned her wedding dress. About an hour before she was ready to leave, her mom finally located the apartment and, later, the rest of the bride’s entourage put in an appearance, as well. Around 1:30pm, the groomoblie signaled its arrival with a loud honk and I left my wife and the bride for the company of ████ and his friend, ██████. We packed two more into the Subaru, ███ and █████, before the long drive out to Eagle Beach. Long, because we were forced to stop and wait twice for road construction. After we finally arrived, I gave a call back to the girls to let them not to worry about the slow going; we already expected them to be a few minutes late. While we were out and about at the beach, Oksana was pulling out of the driveway in the bridemobile¡­ right behind the bus that was hired to chauffeur more than thirty people to the wedding. Apparently there was quite the uproar on the bus when they were noticed. Oksana, thinking that the bus would need some lead time to unload, decided to pull the car off the road for a few minutes. Meanwhile, back at the beach, I was wrangled into helping with the preparations. I was the designated bus spotter. Once it passed by, I knew that Oksana’s Forester couldn’t be much further behind. When I finally saw it nearing Eagle Beach through a gap in the trees, I left my vantage point and escorted ████ to his bride’s-arrival-obscured waiting area. We talked for a few minutes about the sequence of events leading up to the ceremony and then I left him to practice his vows. The bride arrived soon after, but not everyone immediately become aware of her sitting in the passenger seat of Oksana’s Subaru. While Jennifer made an announcement that the audience should pick their spots along the makeshift, driftwood aisle, ██████ made her way to the opposite side of the same shelter that shielded her from ████’s view. Soon enough, the music began and ████ took a few steps forward. A moment later, ██████ did the same and they stood facing each other at the back of the crowd. They walked forward, met at the aisle, and walked together to stand on a small rug laid in the sand. Their backdrop was the snow-capped Chilkats and a true blue sky. It was the warmest day of the year so far and a perfect day for an outdoor wedding. The ceremony was tastefully short. Two of ██████’s friends read a poem. ███ and ███████ sang a song. The flower girl balked just before ██████ and ████ exchanged vows. Rings were swapped; the presiding officer asked if they agreed to be wed. They kissed and, almost before we knew it, walked back the length of the short aisle. They were so swift that many people didn’t have a chance to ready their bubbles! It wasn’t long before most attendees had piled back on the bus and headed into town for the reception at the DIPAC fish hatchery. It had been decided that Oksana would drive ████ and ██████ back into town; I told ██████ that I’d catch a ride with my friend. While the guests were slowly dispersing, Oksana and I helped ███ and ████ pile all the wedding paraphernalia back into ████’s truck. Oksana and I were interrupted in the gathering of small, potted flowers by a request from the newlyweds to sign their marriage license as witnesses. We were honored. ████ and ██████ decided to walk down the beach for some quiet time while we finished loading everything for transport. I told Oksana that we would expect them at the reception around 4pm and hopped into ████ and ████’s car. The ride back into town was slow, what with all the construction and all, but I still put in a request to stop by my apartment for a few minutes — my camera’s memory card required emptying. By the time we arrived at DIPAC, the attending guests that weren’t standing around socializing were already sitting down and eating. ████, ████, and I laid out a few of our possessions at one of the few empty tables in the back and then wandered around. It was my first time visiting the hatchery, and I marveled over the myriad saltwater aquariums. Before we ever got around to eating, an announcement was made that the bride and groom had arrived. ████ and ██████ entered to thundering cheers and applause just before they were quickly whisked to their table and given food. While Oksana was telling me about their quick pit-stop for pictures in front of the glacier, a couple of toasts were made to the smiling couple. We finally got in line for food and, once we got back to our table, I decided that the room was becoming decided stuffy. Other people were gathering outside to enjoy the unseasonably warm weather, and to me the idea seemed much preferable to sitting in the back of a crowded room. Outside by the water, basking on a sun-warmed bench, were two old friends I’d met on a Spanish trip to Mexico, █████ and █████. I hadn’t seen █████ in ages and while I ate my dinner, we caught up. time flew, and before I had finished everything that was on my plate, someone materialized outside to announce that the wedding cake was in immanent danger of being cut. I picked up my plate and positioned myself back inside by the aquarium to take a few pictures while the crowd tried (and failed) to coax the two best-dressed people in attendance into smearing cake all over each other. A few minutes later I was in line to get a piece of my own. Outside, the crowd grew larger. It was getting too hot inside and the party was spilling out onto the cement deck. While I passed the time socializing with other guests, ██████ and ████ hooked up their iPod to the sound system and started the dance music. As they danced the traditional first dance alone, I took pictures of them against a backdrop of smiling guests and snow-capped peaks. While snapping away, I noticed █████ and her husband carrying gifts out to their car. Having been in a helping state of mind back at the ceremony, I was still looking out for areas in which lending a hand might make the day run more smoothly. Our own presents were still in the car, so I borrowed the key from Oksana and transferred it directly from her Subaru to their truck. Afterwards, I helped carry the rest of the loot down from the reception. When I got back, practically the whole party had moved outside and, inside, people were beginning to clean up. Oksana and I took a minute or two to belatedly sign the guest book before looking for some way in which we could help out. Table-clearing seemed well in hand, so we went back outside. ██████ was dancing with her grandfather and, just when I’d convinced Oksana that she should get the dance party started by dragging the groom back out onto the floor, the music stopped. The weather was still warm, the sun high in the sky, but a few people still began to trickle away. Thinking that the party was on the verge of winding down, ████ and ██████ prepared to make their exit. While I was engaged in a great conversation with ██████’s grandfather about the merits of digital photography and online print services, ██████ emerged from the indoor reception area with some long-stemmed flowers. Almost before I could get my camera ready, she had used them all as a replacement for the bouquet toss. Soon after, they left the reception to the guests. We watched them reach ████’s car, called out to them one last time, and let them drive away in an undecorated vehicle. The party was well and truly beginning to break up after that and Oksana and I decided it was time for us to depart as well. ███ and █████ were looking for a ride downtown and ███████ asked if we were headed back to ████ and ██████’s new house. Because that was the plan — we’d arranged to drop off the wedding stuff that was in the back of the car, including the all important marriage license — we offered all three of them a ride with us. As we pulled into ████ and ██████’s driveway, we were surprised to see them standing in the doorway to their own house. They had stopped by to pick up an overnight bag on their way to a Bed and Breakfast and we just caught them. Spontaneously, they asked us all if we’d like to come in a bit and hang out with them — the reception had ended a couple hours before they had planned and, with the sun still high in the sky, they weren’t yet ready to go to their B&B. We piled out of the car and joined a few other reception-defectors in their new, mostly furniture-less living room. We shot the breeze for a half-hour or so and then someone decided that they should open a few of their presents. Sitting on the hardwood floor in front of them, I snapped more pictures as they, still in their fancy clothes, unwrapped three or four selected presents. To keep things from winding down after that, ████ and ██████ asked if those of us gathered there would like to go out to eat somewhere. We quickly decided on Mexican food, piled into a couple cars, and headed for Olivia’s downtown. After a brief, confused hassle, an exceedingly nice family offered to give up their table so that we could avoid splitting up our party of ten. We ordered our food, sat and talked, temporarily abandoned the table and hid from ████ when he went to the restroom, and generally spent another great hour with our newlywed friends. When the dinner was over, we had a crazy time figuring out how to split up the check — the difficulty residing in the fact that everyone wanted help pay for the honored couple’s dinner. We split up after dinner. Some of us went out to party a bit more downtown, some of went home for the night, and ████ and ██████ left us all for their B&B. Before going, though, they invited the lot of us to an informal brunch the following morning at 10. It had been a long day and Oksana and I were content to go home and flop into bed, but for some reason we decided to stop at the post office. It had long since closed, there wasn’t any real reason to check our box at midnight, but we knew the numeric code to get in the door, so what the heck. Inside our box was a strange looking package; neither of us were expecting anything. We carried it to the counter and opened it there. Inside was a small black square with the word “Sephora” printed on the top. The square turned out to be a case of sorts that, when opened, had mirrors on each side, like a makeup compact. There was a credit card inside that identified itself as a gift certificate. Oksana knew that Sephora was an online retailer for girly things, I didn’t. We dug deeper into the package and found a tiny little card inside a tiny little envelope. On the card was a typed message: “Oksana, thank you so much for making me pretty on my wedding day. –██████.” What the…? From ██████? Wow, what perfect timing! Morning, for me, came at 7am. I got up, took a shower, and then plunked myself down in front of my computer. I spent a half-hour organizing photos into different folders and then burned everything I had to a DVD-ROM. I left Oksana to get ready on her own, grabbed a handful of blank DVDs and cases, and, at 8:30am on a Sunday, drove to work. Media Services had all the PhotoShop templates I had created in the course of my job. I used Premiere to haphazardly put music to the time-lapse of ██████ getting ready, set it to render, and used the downtime to create a DVD cover. I copied the photos over to my hard drive and selected one for a disc label. Encore was fired up and a very down-and-dirty DVD was authored — a five-minute “movie” set to a techno version of Pacabel’s Canon was the only video on it — but every wedding picture we took the day before was included on the DVD-ROM portion of the disc. While printing and cutting out the label, I realized that waiting for the computer to finish was going to make us late to the brunch. When Oksana arrived, I asked her if she thought the project was worth being late over. One look at the DVD cover and she said, “Let’s be late.” Hopefully ████ and ██████ would agree with our decision. The computer was chugging along and all we could do was wait for it, so Oksana and I decided to use the time constructively to add a couple more impromptu wedding gifts to our basket. Our favorite picture was one that Oksana took of the bride and groom kissing — I printed it out and she cut it to fit a cheap, white frame we had on hand. While she was doing that, I decided to give the panoramic photos a whirl. I threw them into a program called “Autostitch” and, 15 minutes later, it surprised me with the results. Though the resolution would have allowed me to create a respectable poster out of the resulting image, the biggest I could print at Media Services tabloid-sized. As soon as the DVD finished burning, we moved the disc from the drive to the printer. 5 minutes later the lights were off, the door was locked, and we were driving towards town. We arrived about 45 minutes late, but it was worth it. ████ had just sat down on the couch with his laptop to begin showing wedding pictures on the big-screen TV. Oksana and I presented our cobbled-together gifts to many Ooo’s and Aaah’s and, while everyone watched the TV, we sneaked ourselves a leftover bagel or two from the table. Eventually, ████ got around to spinning up our DVD and we all watched ██████’s four-and-a-half hour transformation process play back in just five minutes. Unfortunately, shortly after we’d arrived, the brunch began to break up. Many people seemed to be flying out of town on the same plane and there was a large migration to the airport. We decided to stick around for a little while and, once those that were leaving were safely on their way, ████ and ██████ decided to open a few more wedding gifts. Oksana and I, along with other friends and family, soaked up the sun in their bright new living room and smiled along with them. The afternoon advanced, the house began to empty, and, with the sun beckoning, Oksana and I finally left the rest of the weekend to the newlyweds. Watching your friends get married is always a special occasion but the weekend that ████ and ██████ got married will always stand out in our minds. If not because we happened to meet on the same trip, then because we were invited to take an active role in the planning, rehearsal dinner, ceremony, reception, and post-wedding brunch. To ████ and ██████: I originally intended this to be a short entry about the weekend. Oh, well, nuts to that. Maybe, years from now, this will spark some happy memories. Congratulations, and may your relationship founded in Venezuela bring you as much happiness as our own has! Uh this is interesting. Where do I file for the Freedom of information act to see the whole thing? Did "they" not wish to have their names or photographs online? Drats, I posted two pictures from the wedding on my blog…I’ll take them down though if you think I should. Did you use your still camera for that short video? Actually, no. I used a Sony digital camcorder with a DV cable (iLink, Firewire, IEEE1394, or whatever else you’d like to call it) connecting it to my laptop. I then used Premiere 6 to digitize the video, using the stop-frame capture feature instead of the normal movie capture. Capturing 1 frame every 2 seconds will give you a 60x increase in speed (conveniently making 1 hour elapse in 1 minute). Premiere 6 is great for this – too bad Adobe didn’t keep the same functionality in the next version (Premiere Pro). • Disable the screen saver / hibernation / standby modes on the laptop. They’ll stop the recording. • Don’t attempt to use any other programs on the laptop while capturing. Premiere must remain the foreground application, or it’ll stop recording. • Plug in both laptop and camcorder to AC power. Batteries work fine… until they run out of juice.